So, a normally quiet time of the year has ended up being as busy as any other: no rest for the wicked! 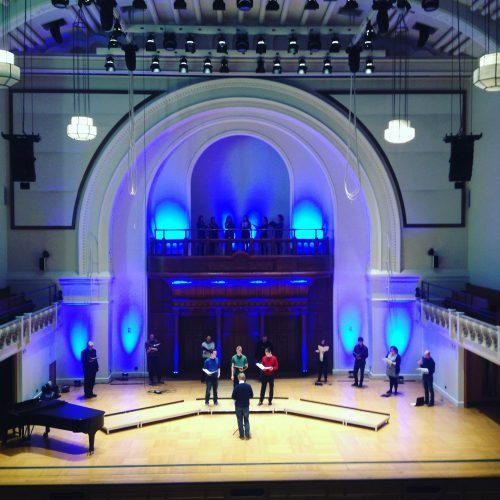 We had a fabulous team of singers performing in our concert at Cadogan Hall for our ‘Tour de force’ French programme which includes Poulenc’s Figure Humaine. In fact, there’s plenty of other really difficult repertoire in the programme, such as Perotin’s wonderfully hypnotic motet Viderunt Omnes. For the three tenors singing the moving parts it probably feels a little relentless as it tests their concentration to the limits, not to mention their vocal stamina: it’s about 12 minutes of short phrases (with only one short break for some plainsong sung by women) that are all almost identical, but not quite! For me a highlight was Messiaen’s O sacrum onvivium which tests the singers control and nerves. As always, they rose to the challenge and gave a performance I’m sure the composer would have approved of; intense but clam and reflective, echoing the sentiment of the text. Figure Humaine was a blast. It’s such a technical challenge but the real test is to put all the ‘nuts and bolts’ technical issues to one side and make the music come off the page. It brought back loving memories of working on this piece with our co-founder Barbara Pollock. She was a French speaking Swiss lady of great intelligence who drummed into us the meaning of the texts and tried hard to help us perfect our French pronunciation! Voting for the BBC Music Magazine Awards has now closed so it’s in the lap of the Gods as to who wins. Many thanks to everyone who voted for us and congratulations to the other two groups, The Tallis Scholars and the wonderful Alamire, for making it such a hotly contested Award. The result will be announced on April 5th so we have to wait with baited breath until then. On a personal note I had a few days back in Villars, Switzerland with the family and gave Ella and Joshy their first experience of skiing. I could have said ‘taste’ of skiing which might have been appropriate for the number of times I found either one of them face down in the snow on their first day! However, they both showed great determination (perhaps patience is pushing it too far…) to get to grips with it and boy did they succeed . Together with a 10-year-old family friend they managed a little slalom course, a black run and even a mogul or two. One proud dad watching them make it to the bottom of each piste safely – and one relieved mum! Artwork for our latest upcoming release, ‘On Eagles’ Wings’. 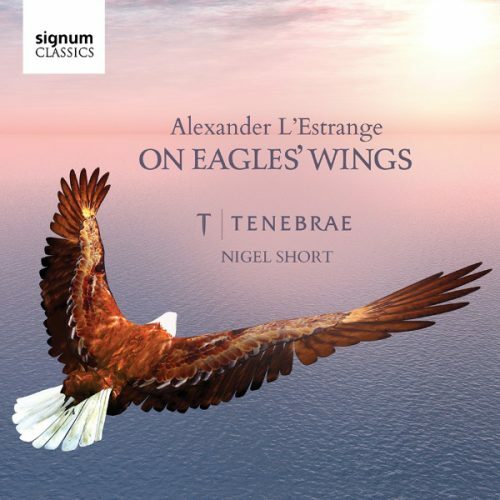 Next on the horizon is our concert on April 7th to launch our recording of works by the composer Alexander L’Estrange and the disc comprises of a collection of pieces he’s written over the last 15 years or so. There’s a great mix of compositions that all have the hallmark of Alex’s amazing grasp of harmony, infused with lots of jazz chords that are a joy to sing and listen to. We’re delighted to be joined by our choral development partners – The Music Centre, directed by Richard Frostick – to perform Alexander’s Panis Angelicus as part of the programme. The concert will be in St James, Spanish Place on Marylebone High Street, surely one of the most atmospheric churches in London – neo gothic architecture, a fabulous organ and probably one of the finest acoustics around. Lots of nearby shops and pubs too for much needed refreshment after the concert! Hope to see lots of you there.